Manuscript culture had a close relationship with pen and ink. 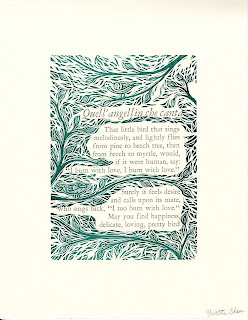 How then to connect current students with little affinity for handwriting to the painstaking craft of lettering by hand? 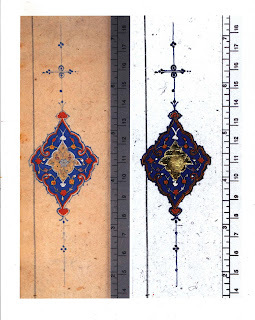 In October 2018 Special Collections hosted a visit from Farshid Emami's Art History class: "Paintings, Portraits, and Prints: Arabic and Persian Book Arts" where we discussed the work of Islamic scribes, the geometric design principles behind Islamic decoration, and the structure of the Islamic book. 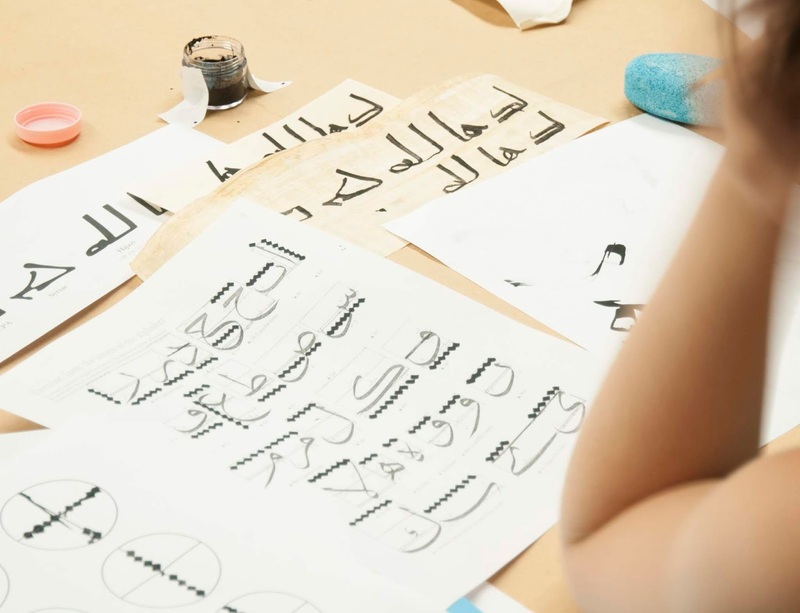 Given the students' lack of familiarity with the scribal arts, we also arranged for students to scribe in Arabic on papyrus using authentic reed pens and carbon black ink that was mixed for dipping. 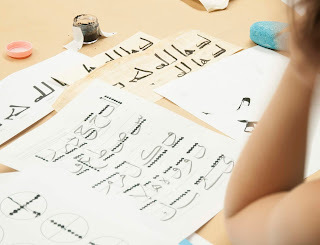 The students were able to experience for themselves the process of writing out Arabic letters in the traditional manner working from right to left across the page, learning the calligrapher's way of measuring distances by pen strokes. This class was followed in November 2018 by a set of three smaller workshops where the students tried their hands at gilding with gold leaf and painting a copy of a marginal ornament taken from our 16th century Qur'an. Original scan on the left, reproduction on the right. Students were also able to try Turkish marbling to decorate sheets of paper. Not only are they receiving a kinesthetic learning experience that they'll remember, they were also having a lot of fun. 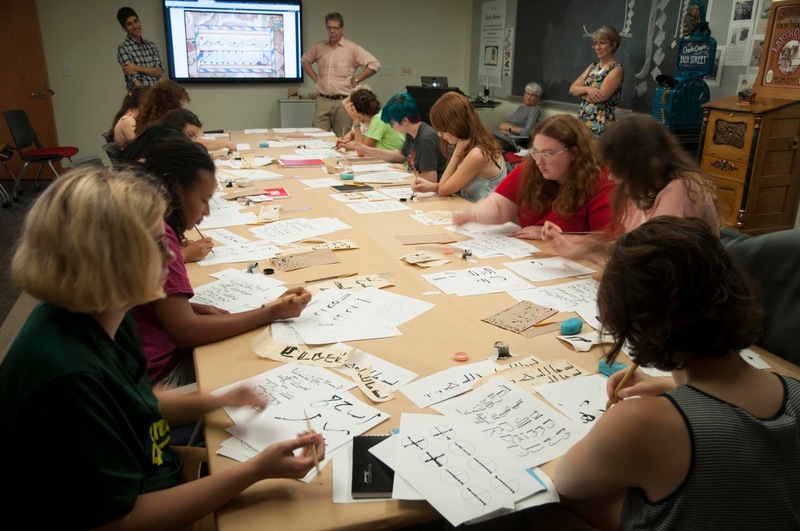 The "lab" approach to learning in Special Collection has proven so welcome to both faculty and students that calligraphy may somehow need to be added to the hands-on instruction in making papyrus sheets, print identification, letterpress printing, papermaking and binding. It's spring break here at Oberlin, but that doesn't mean we are taking a break from classes. Our student population has just become a lot shorter in stature. 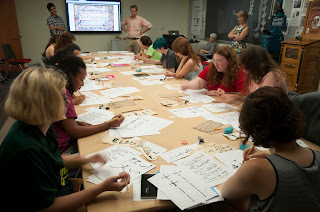 On Monday afternoon, the Oberlin Heritage Center brought their Pony Express and Printing Press campers over for a visit in Special Collections and the Letterpress Studio. The 8 to 12 years old joined us first in the Forsythe Classroom to look at ancient artifacts, both facsimile and real, that explained how communication developed over the millennia. We then moved on to the Letterpress Studio, where each student had the opportunity to set his or her name by hand and everyone took turns pulling two prints from our Challenge Gordon press. Campers also learned the values of patience, as printing your name with moveable type takes a whole lot longer than it does with a computer! It looks like Oberlin has a new generation of printer's devils on our hands! 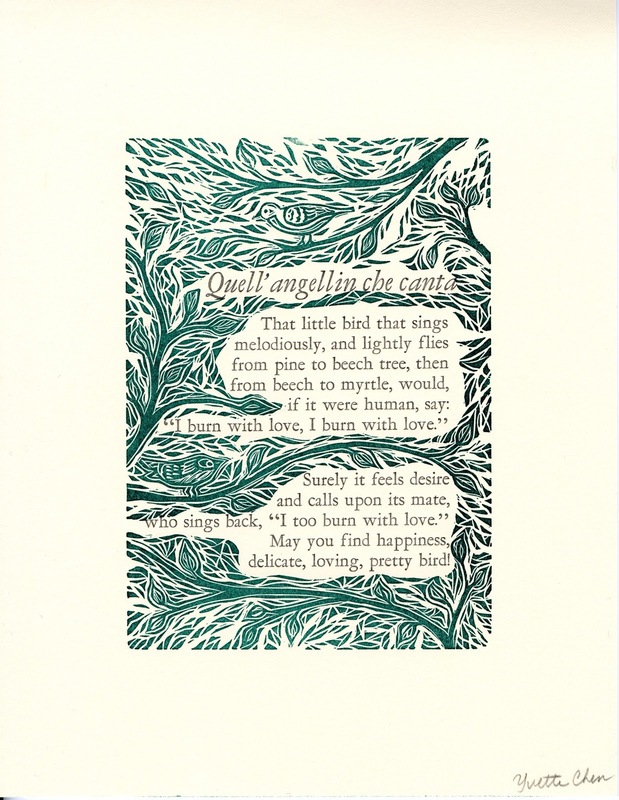 Another productive and instructing Winter Term in letterpress printing was held in January 2013. Ten students had the opportunity to form a new relationship with paper, typography, design, and the painstaking process of printing using moveable type. Once again, we employed the services of Bob Keleman, who teaches letterpress printing and graphic design for Kent State University and the Cleveland Institute of Art. The class also visited the Morgan Art of Papermaking Conservatory in Cleveland and Madison Press in Lakewood. A new opportunity to make our own wood type using a pantograph machine came with a visit from Scott Moore. Students selected templates and cut their own pieces of wood type to keep. 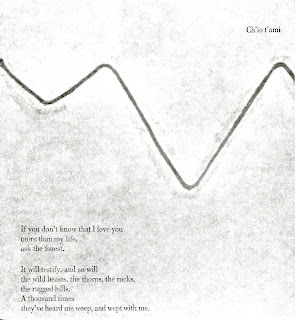 This year's final project was a collaboration with Oberlin College Press and poet, Mary Ann Samyn, to interpret one of her poems as a broadside. 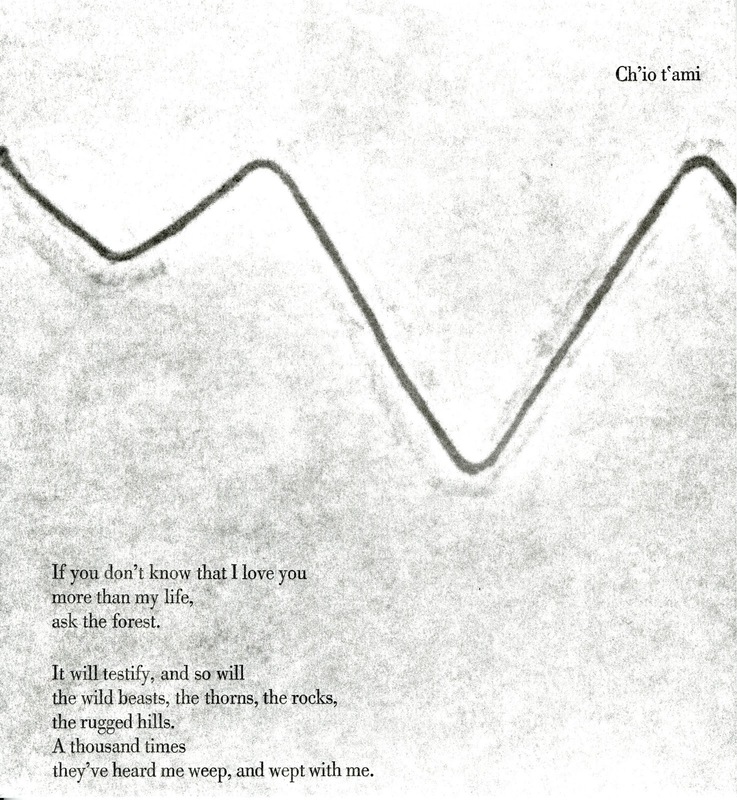 We also made broadsides for faculty member, Nick Jones, who is translating the poetry of Giovanni Battista Guarina, a 16th century Italian poet. 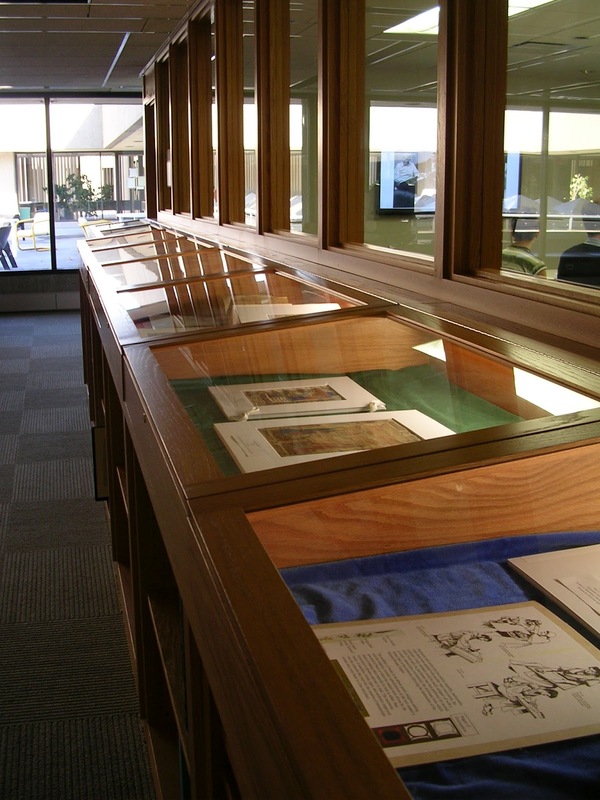 Some more features of the newly renovated Goodrich Room include additional flat files and a display area for our friends in the Archives. The cabinets include a slanted work surface for large maps, with bright, task lighting overhead. The new classroom now has an attractive plaque, honoring former Obie, Margaret Forsythe (Class of 1946). We have Margaret and her family to thank for this amazing space, complete with its fancy gadgets. The classroom has already been put to good use and we're only a month into the semester! The temporary tables in the classroom have been replaced with ones that have adjustable bases. Now they can be used at a standing, as well as a sitting, height. This should prove especially helpful when a large class visits Special Collections or Archives. The drinking fountain was converted into a sink for hand-washing. It is conveniently located next to the classroom, so students can access it without disturbing the other patrons who are working in the open reading area. Patrons have reported that the new furniture and arrangement of the space is much more to their liking. The new chairs have definitely been a comfortable upgrade! To control clutter, improve security, and prevent extra water and contamination from entering the Goodrich Room, lockers and a coat rack have been installed in the corridor outside of the reading space. Sarah Hamill's History of Photography Class! Sarah's class came to Special Collections on Tuesday, September 11, 2012 to learn about (and play with) some of our optical toys. Special Collections Librarian, Ed Vermue, has only just begun adding optical toys to our holdings over the past year or two, but we already have quite a collection! The class spent half the time listening to a lecture in the new classroom (Sarah also gets the award for being the first faculty member to use our new television and overhead camera) and the other half experiencing the optical toys in a hands-on setting. ... and then it was time to get down to the serious business of playing. Our new cases are showing off their first exhibit! Nineteen manuscript leaves and several codices are on display from now until the Campus Crawl on September 22nd. 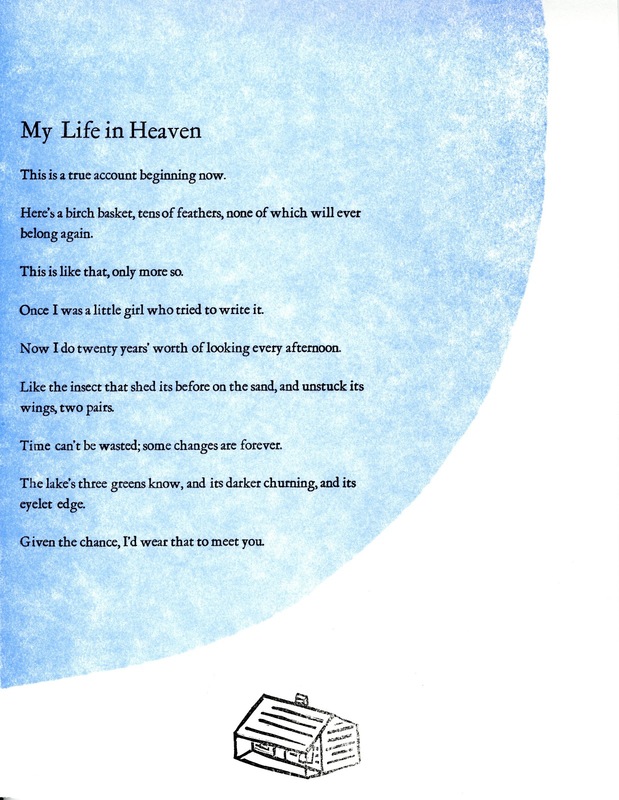 The current exhibit has been curated to aid an assignment given in Jen Bryan's Chaucer class. Included in this exhibit is our brand new... if 1450 can be considered 'new'...manuscript leaf from a German missal. It was acquired with a grant from the Breslauer Foundation just this past summer. Students also worked from our (HUGE) 15th Century Italian Antiphonal (Note how the book has its very own cart to wheel it around!) and a facsimile of the Ellesmere Chaucer. Have we mentioned how much we love the seating in our new waiting area? A student takes advantage of our comfy chairs while he catches up on some reading and waits to use the materials. Remember to stop by and check out the exhibit. It will be up until the 22nd! Introducing the New and Improved Goodrich Reading Room! After a long summer of tearing down walls, replacing windows, debating chair colors, and rewiring electric, the Goodrich Room is finally complete (and looking better than ever, we might add)! Tables with electrical outlets, comfortable chairs, new lighting, and a waiting area are just a few of the improvements to the room. Archival Assistant, Louisa Hoffman, helps our first patron with a reference question. Seating for the new waiting area we lovingly refer to as 'Mad Men chairs'. We knocked down walls to give you this state-of-the-art classroom, complete with an overhead document camera and a television the size of a drive-in movie screen. Visit our new facilities between between 1:00 and 4:30, Monday through Friday, and let us know what you think! Welcome to the Oberlin College Library's Main Special Collections's blog!